northern free states and Canada. name "Moses of Her People"
For the past two weekends on Let's Talk, we've had author guests who had to fight incredible battles: Jennifer Slattery from two weeks ago who lived a homeless life at one time, and Lori Benton from this last weekend who battled cancer. These were epic fights. And this week in the news, you may have heard that Harriet Tubman was chosen to be the new face on the twenty dollar bill. I was absolutely ecstatic to hear the news. This woman rose way beyond race and gender to be a person who risked her life to fight a fight that needed fighting. Homelessness. Cancer. Slavery. Only a few of the battles faced by so many people every day. Battles that were not fought alone. Yet all three of these women spearheaded their fights, went to battle and fought their fight. God does not ask us to sit back and allow issues to overwhelm us. This IS NOT being meek. This IS NOT submissive behavior. My favorite go to Bible example for this topic is John the Baptist. I would have loved to stand in the room where he accused Herod of the evils done. Herod murdered his own brother then married his brother's wife. John the Baptist boldly proclaimed to Herod's face that this was wrong. We have a voice. God gave us one to use respectfully...but use. He doesn't expect us to watch while someone abuses another. 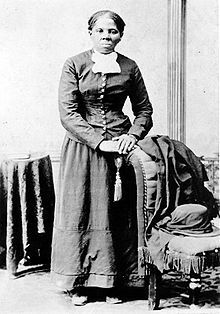 Harriet Tubman, a woman who could not read, was a genius. An innovative thinker. A creative and bold woman who saw a great need and refused to stand idly by while lives were ruined. As you probably know, the "Underground Railroad" was not a tunnel, a train, or an easy route. Hundreds of people of all color pitched in, learned the code, made secret hiding places, fed strangers seeking freedom. The cost was immense. For all involved. Harriet and those she led had to hide...like David from Saul. People like Abigail who fed David and his men fed Harriet and the people with her. All around us people are fighting battles. Addiction, homelessness, abuse, financial, loneliness, illness, abandonment, hunger, trafficking, tragedy like the earthquake in Ecuador, etc. 2. Do what Harriet, Jennifer, and Lori did, get involved and fight. Jesus did not sit on HIs throne in heaven and watch the world He created fall apart. He left His throne, came as a baby, lived among us as an example, then gave. Jesus fought the fight. God is telling you right now what battle He wants you to fight. Agreed! God never leaves us alone. He is always accessible through prayer and our own willingness to act. Nice to meet you. I'll be praying for you regarding whatever fight you may have, are, or will be facing.